Naturally, the Wheel of Fortune slots are based on the popular TV Show of the same name and are one of the most famous all over the world. They’ve been developed by the IGT (International Gaming Technology) group, which is also known for developing such games as Megabucks, The Amazing Race and many others. With activated Wheel of Fortune slots bonus, you may win from 25 to 1000 coins, or if the luck will be on your side – a progressive jackpot, which is, by the way – pretty big in these games (it may even achieve the number of one million dollars). But if a player wants to get this bonus, he/she should go with the max on every spin. 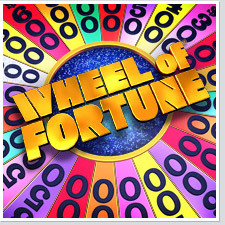 Multiplayer edition: It’s the good old wheel of fortune slots, with one significant difference – it is played by 8 players players at one unit, but with separate screen for everyone. And the most interesting part is – if someone gets the “Wheel of Fortune” bonus, everyone else in the unit gets it as well.